Grand Pacific returns to Spokane Gun Club! « Shoot P.I.T.A. 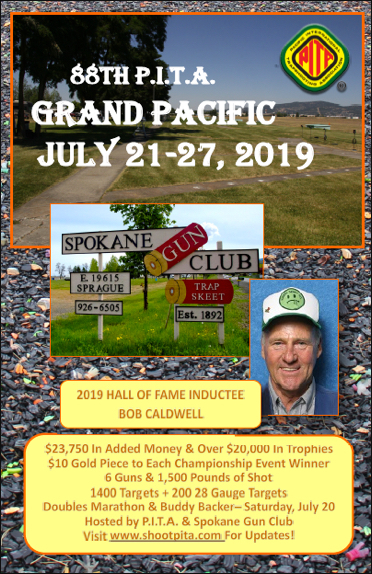 Grand Pacific returns to Spokane Gun Club! We are happy to announce that the PITA Grand Pacific will be returning to the Spokane Gun Club for 2018. Mark you calendar for July 22 through 28, 2018 and start making your plans to attend! We are taking RV reservations and preference will be given to those who had spaces last year so contact Sue Brewer right away to reserve your space. The deadline to do so is February 15, 2018. After that date, all unreserved spaces will be open for anyone to reserve. Call 541-619-9393 or email sue@shootpita.com. As always, we will need volunteers for everything from driving the taxi to helping with raffles and refereeing doubles. If you are interested in volunteering for anything, please contact Jennifer Carter – 503-931-4211 or click here to email.